Real estate and civil litigation transaction levy filings and payment (if any) are due for the quarter ended December 31, 2018. Last date to qualify for a $50 early payment discount on the 2019 policy premium (see the 2019 Program Guide for details). Real estate and civil litigation transaction levy filings and payment (if any) are due for the quarter ending March 31, 2019. Annual exemption forms are due from lawyers not practising civil litigation and/or real estate in 2019 and wanting to exempt themselves from quarterly filings. Real estate and civil litigation transaction levy filings and payment (if any) are due for the quarter ending June 30, 2019. File your LAWPRO Risk Management Credit Declaration by this date at lawpro.ca to qualify for the $50 premium discount on your 2020 insurance premium for each LAWPRO-approved CPD program (to a maximum of $100) completed by September 15, 2019. 2020 Insurance Renewal Application filing begins: The online filing of Professional Liability Insurance renewal applications for 2020 is expected to begin. If you wish to file a paper application instead of filing online, please note that paper renewal applications will not be automatically mailed out, but it is expected that you will be able to download a 2020 pre-populated paper renewal application from our website starting on or about October 1, 2019. Real estate and civil litigation transaction levy filings and payment (if any) are due for the quarter ending September 30, 2019. E-filing deadline for renewal applications: For 2020 Professional Liability Insurance renewal applications successfully filed online on or before this date, a $25 per lawyer e-filing discount is expected to be applied against 2020 insurance premiums (subject to Program approval by Convocation). Successful e-filing will result in a confirmation number that begin with the letter “P”. 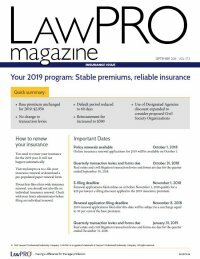 Renewal application filing deadline: For 2020 Professional Liability Insurance renewal applications received by LAWPRO (online or otherwise) after this date, a surcharge equal to 30 per cent of the base premium is expected to be applied against 2020 insurance premiums (subject to Program approval by Convocation).